KOKOMO, Ind. — In a time of fierce competition for teaching jobs, nearly 80 percent of Indiana University Kokomo's School of Education 2012 graduates are employed at schools this school year. Dean Paul Paese said this demonstrates the quality of teachers graduating from the program, and is encouraging news to those considering careers in education. "This is a tribute to the performance and quality of our students, program and faculty," he said. "The public school corporations in our region had more openings than in the previous two years, and the expectation is there will be more openings in the next several years, because of retirements and need in math, science and special education. This is a great time to major in education at IU Kokomo." Those who found jobs included the three graduates honored as Outstanding Future Educators by the Indiana Association of Colleges for Teacher Education. Tiffani Bonifant is teaching social studies at Taylor High School, Kourtney (Cox) Hainlen is teaching second-graders at Tri-Central Elementary, and Vincente Lorenz is teaching science at Kokomo High School. Hainlen and Lorenz both accepted jobs in the schools where they did their student teaching. All three believe their IU degrees, along with the awards, made them stand out from the other applicants. Andy Robertson, director of student teaching, said the awards are the most prestigious recognition given to student teachers. "We encourage our best and brightest future educators to apply for these awards. We have excellent education majors, and it is hard to choose just three. Tiffani, Kourtney and Vincente are outstanding representatives of our School of Education." Bonifant enjoyed student teaching social studies at Western High School. She was pleased to receive the award. "It certainly is gratifying to know I have been recognized for my hard work. To be recognized by IU Kokomo as one of the three most promising teachers isn't something I expected." Hainlen dreamed of becoming a teacher since she was very young, playing school with her dolls, rather than house. She hopes having the award on her resumé helps her achieve her longtime dream of having her own classroom. "I always admired my teachers and wanted to be like them when I grew up," she said. "I wanted to be the creative teacher who makes learning fun. It makes me feel really good, to know people think I am a good teacher." She said her classes prepared her to succeed in the classroom, especially in teaching reading. Lorenz previously earned an associate's degree in landscaping horticulture, then decided he wanted to teach. He especially enjoys working with special needs students, and may return to IU Kokomo to become a special education teacher. Lorenz said he was happy, but surprised, to be one of the three IU Kokomo students chosen for the award. 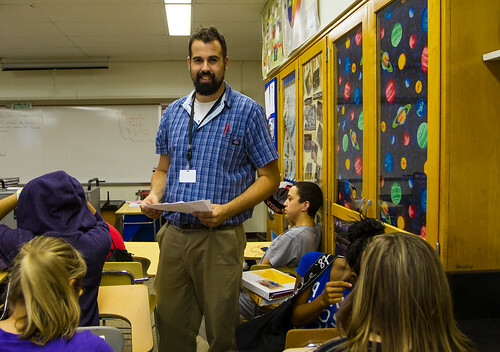 "There are a lot of really good future teachers in our cohort, so I know it was competitive."